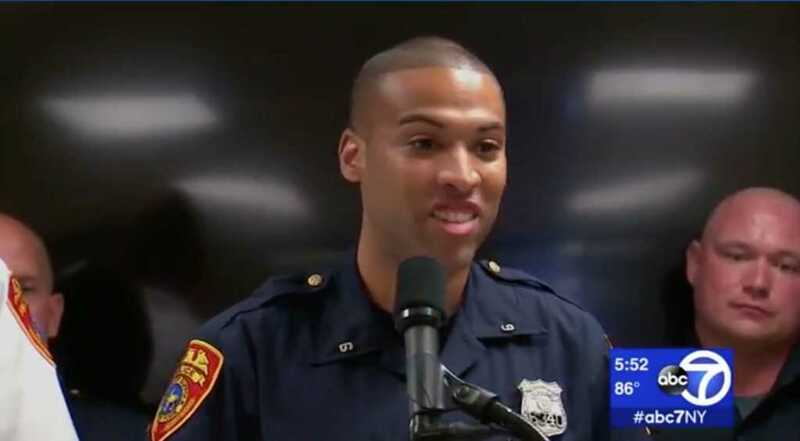 A New York police officer has a useful talent that has served him well in his time at the Suffolk County Police Department: Delivering babies. In his five-year career, baby whisperer officer Jon-Erik Negron has delivered three babies, WABC-TV reported. The latest delivery happened on Thursday, when Negron was called to a home in Terryville, New York, just after 2 a.m..
Dispatchers informed Negron that a woman there was giving birth. “The radio call comes over, and you’re like, ‘This can’t really be happening again,'” he said. Third time’s a charm. The woman, Keri Fort, gave birth to a healthy baby girl, and mother and daughter were soon transported to a nearby hospital in good condition. “Out of the three, this was by far the easiest,” Negron said. A birth that Negron helped with last year wasn’t so easy. In August 2017, after Negron helped to deliver a baby boy in the kitchen of a home in Mount Sinai, New York, he noticed the baby wasn’t breathing. The quick-thinking officer then swiftly removed the umbilical cord that was wrapped around the baby’s neck and cleared fluid in his airway using a plastic syringe he found in the kitchen. Last month, the parents of Bryce Pappalardo named Negron as his godfather. Negron said the role is the “most meaningful thing” that has happened to him in the job. “This superseded anything I imagined on having an impact as a police officer,” he said. The pair has a “special connection that will last a lifetime,” Pappalardo said. Negron also helped to deliver a baby on the side of the road in Suffolk County, WABC reported.